James Rosenquist is the whirling dervish of Pop Art, spinning and spewing out incongruous collections of images that smack of banality and surprise with almost catacylsmic energy. This traveling exhibition, which started at the Menil Collection and the Museum of Fine Arts, Houston, and went to the Solomon R. Guggenheim Museum in New York and then to the Guggenheim Museum Bilbao, is huge, which is in keeping with the artist's beginnings as a billboard painter. It is accompanied by a humongous catalogue that is more dazzling and sumptuous than the exhibition. For many, Rosenquist's early work, which won him reknown, will be nostalgic and a fine recollection of the fabulous 60s. For others, however, his later work will be much more interesting and demonstrate that he was far from being just a 15-second, one-note trick pony. Indeed, whereas his early work was marked by jarring and simplistic, however resonant, juxtapositions, much of his later work has something of a cosmic force with effectively bold compositions. The paintings themselves are a bit disappointing given their absence of painterly touches and huge scale, but one is awed by his technical skills and mightily impressed by his intellectuality. We are smacked in the face by the blatant commerciality of his commentaries on advertising and at the same time inspired to conjure derivative images ourselves. 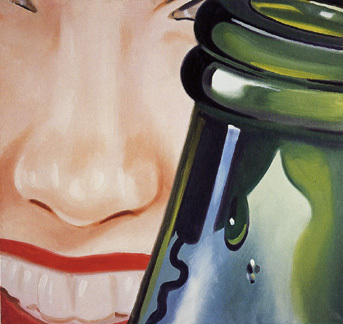 Rosenquist's best work is provocative in the best sense. 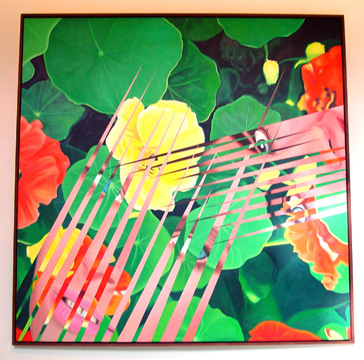 "Since the late 1950s, James Rosenquist has been creating an exceptional and consistently intriguing body of work. His oeuvre is a clear demonstration of a gifted artist's pursuit of a unique aesthetic path that also reveals larger truths about the surrounding culture....As a commercial artist painting billboards in the 1950s, Rosenquist was witness to and absorbed the advertising media's powerful mechanisms of influence. Executing vast advertisements high above the crossroads of the world in Times Square, he learned firsthand how to distinguish the media from the message and how to frame the differences. In 1960, he turned away from commercial art and, channeling aspects of that experience, focused on his fine-art career. Through shifts in scale and content, Rosenquist reformulated photographs and advertising imagery from popular magazines into a kaleidoscope of compelling and enigmatic narratives on canvas....Rosenquist's work has poignantly registered social and political concerns and reflected upon the dynamics of modern capitalist culture - an ongoing critique tht reached its first zenith with the monumental F-111 (1964-65). Superimposing images of consumer products, an underwater diver, a doll-faced child, and an atomic explosion along the fuselage of an F-111 bomber plane, the work illustrated the connection between America's booming postwar economy and what President Eisenhower characterized as the miltiary-industrial complex....Inspired by the possibility of a new work as far-reaching and significant as F-111, I began talks in 1996 with the artist about a commission for the Deutsche Guggenhim Berlin. In response, Rosenquist created the monumental and vibrant three-painting suite The Swimmer in the Econo-mist (1997-98), the first work commissioned for the Deutsche Guggenheim Berlin and a centerpiece of the collection." 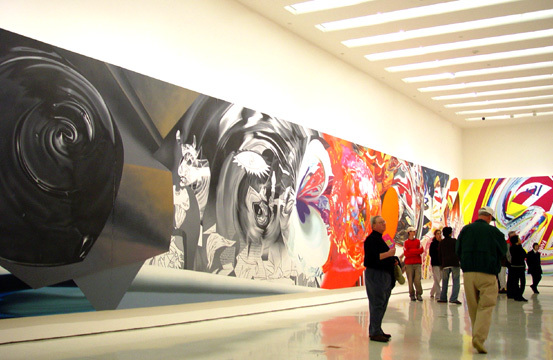 "Rosenquist creates his work with paint that he mixes by hand and applies with a paintbrush. These techniques may be seen as antiquated or old-fashioned in the age of media art, but Rosenquist...continues to challenge In his audience with novel and remarkable imagery that remains on the vanguard. We believe Rosenquist's objective has been to create dynamic artworks, which, in intensity of color and size, spatially embrace and emotionally engage their audience. Yet, Rosenquist's artistic achievement fascinates beyond its formal brilliance, as his work reflects a critical interest in social and political issues the world over." In his sponsor's statement, Bruno Salzer, the chairman and CEO of Hugo Boss, said that "We at HUGO BOSS are fortunate to have worked on a very special project with James Rosenquist: the production of an edition of 250 'Rosenquist' paper suits, which were designed as reproductions of the famous brown-paper suit that had been tailored for the artist in 1966." Delta Airlines is the third major sponsor of the show. 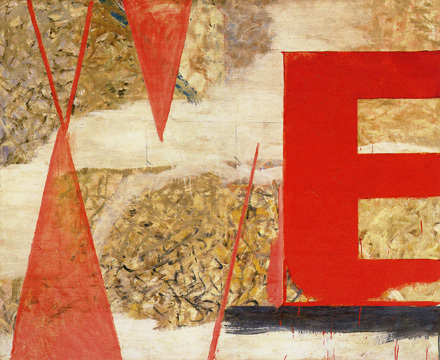 Some of Rosenquist's earliest paintings hold up extremely well. "Astor Victoria," for example, is an extremely fine abstract composition. A billboard enamel and oil on canvas, it measures 5 feet 7 inches by 6 feet 10 1/2 inches. Executed in 1959, it is in the collection of the artist. "James Rosenquist was born on November 29, 1933, in Grand Forks, North Dakota, at the Deaconness Hospital, which later became the Happy Dragon Chinese Restaurant. He spent much of his childhood in North Dakota, Minnesota, and Ohio, often in farming communities, and to this day refers to himself as a farm boy who just happened to become an artist. He keeps a tractor on his property in Aripeka, Florida, on the Gulf of Mexico....One of Rosenquist's aunts made marionettes and model airplanes with him, and his mother wqsan amateur painter, whose work hung in the house. When he was left to himself as a cyhild, he would roll out yards of wallpaper and draw on the white side, producing long continuous stories.. His family moved to Minneapolis when he was nine, and he visited the Minnapolis Institute of arts but was scared off by the mummies in the collection....It was not until he was eighteen that Rosenquist encountered serious painting; he hitchhiked fro the University of Minnesot, where he was a student, to the Art Institute of Chicago and was just stunned by what he saw there - works by Edgar Degas and Claude Moent, as wll as more modern pieces by Georges Braque and Pablo Picasso. At university, Rosenquist came under the tutelage of Cameron Booth. A veteran of World War I who had studied with Hans Hoffman in Miunich, Booth was probably the most interesting Abstract Expressionist in the Midwest....Rosenquist must have shown talent early on, because by 1955 he had won a scholarship to the Art Students League in New York....Rosenquist arrived in Manhattan in September of 1955, got a room at the YMCA, and promptly headed off to the Cedar Tavern, as he puts it, "see the old guys" - Willem de Kooning, Franz Kline, and the other artists of their generation, who were regulars there. But when he got to the bar 'the vibes were terrible.' The militant black poet LeRoi Jones, who later changed his name to Amiri Baraka, was having a drink and had just got into a terrible argument with George Lincoln Rockwell, the head of the American Nazi Party....At the Art Studens League, Rosnquist studied with three artists of note: George Grosz, from whom he learned a delicate touch with color; Edwin Dickson, an early modernist, and on of the most underrecognized figures in American art...' and Robert Beverly Hale, an interesting artist who taught classical drawing and was a curator of the Metropolitan Museum of Art, where he distinguished himself by acquiring works by de Kooning, Kline, Jackson Pollock, and others....To get by financially, Rosenquist worked briefly as a chauffeur and bartender for Roland Stearns, a son of one of the founders of Bear Stearns; then he joined the sign painter's union....He claims to have learned more fro his fellow 'paint smearers,' as he calls them, that he did in art school....If you are painting Gregory Peck in a movie billboard, you have to make him recognizable from blocks away, even though you are working right against the surface, high up on scaffolding. So you grid it out, and you learn to see what you are doing from any distance. Rosenquist quit the buisness by 1960, afte a fellow worker died falling from scaffolidng....In 1958 and 1959, Rosenquist produced his first truly mature paintings, which he has called 'excavations'....He also referrred to them as the 'wrong-color painitngs,' because they were oten made with paint discarded from his commercial jobs....The excavations are delicate, textured works, almost abstract, with small strokes in an allover pattern on the canvass . Though they are nonobjective, some have faint geometric shapes or lettering in them, which were based onb the traces or stairs,other structures, and signs that Rosenquist noticed on the sides of buildings while he was up in the air working on billboards - the pentimenti explosed when other buildings were torn down....In 1960, he settled into a loft at 3-5 Coenties Slip, on the East River waterfront in Lower Manhattan, a building where a number of other artists - Robert Indiana, Ellsworth Kelly, Agnes Martin, and Jack Youngerman - were already living and working....Before he met Roy Lichtenstein or Andy Warhol or saw what they were up to, he was already making art that was veyr much related to theirs. ..Rosenquist has talked about the terror of the bare studio. He saw some of the artists around him fixing up their studios, ...and he began to wonder whether they would ever have the courage to start producing work. He told himself he was not going to all into the same trap, so in order to have something to look at in his studio he began collecting, from magazines and other sources, advertisements and photographic reproductions that he spread out across the floor and pinned up on the walls. He arranged them in certain ways, as he tried to decide what he was going to paint. Eventually, the clippings were incorporated into collages that he made in preparation for the paintings." A Pop Art classic, "Hey! Let's Go For A Ride," is a very, very fine Rosenquist painting from 1961. An oil on canvas, it measures 34 1/8 by 35 7/8 inches and is in the collection of Samuel and Ronnie Heyman of New York. Mr. Hopps recounts that the term "Pop" began in England in the mid-1950s when it referred to mass-produced products "and later to the artworks - featuring imagery appropriated from advertising and popular culture - made by a group of English artists, beginning as early as the late 1940s, with Eduardo Paolozzi's collages..., and including such works as Richard Hamilton's iconic Just what is it that makes today's homes so different, so appealing? (1956). Other artists in the British movement included Derek Boshier, David Hockney, Allen Jones and an American working in England, R. B. Kitaj, and their work was full of images from American magazines....Pop art also turned up in France and Germany, where it countered the prevailing nonobjective art. In France, there were Yves Klein's kitsch objects that he made by spray-painting souvenir casts from the Louvre with International Klein Blue, and Martial Raysse's sculptural works incorporating neon lighting....In Germany, there were the collage-like paintings of Sigmar Polke...and the grisailles of Gerhard Richter, both of whom made extensive use of photographic sources....When recognition first came to Rosenquist, with an exhibition at Bellamy's Green Gallery in February 1962, he was hailed as a new and important member of the nascent Pop art movement in America - thanks mostly to his renderings of consumer products, from peaches to paper clips, and of movie stars, such as Joan Crawford and Marilyn Monroe....Rosenquist was undeniably an important figure in Pop art, but his significant work began independently of the movement and continued on to become something that was quite distinct from it. In Pop art, there is generally a figure-ground relationship - a rendering of a specific object, often an inherently flat object, such as a flag, or a newspaper page, against a colored or neutral background. Simple graphic devices - outlines and colorrelationships - may suggest a sort of depth, but ther eis rarely any perspective. 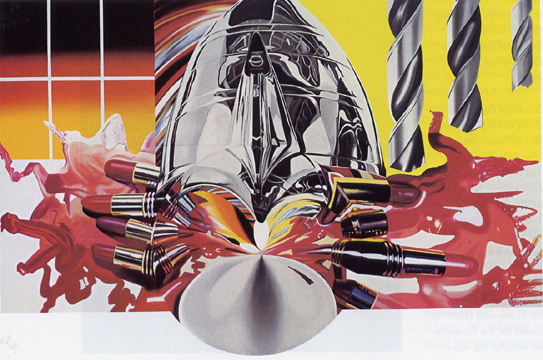 Rosenquist, however, rendered forms three-dimensionally. Few of his images seem to sit precisely on the picture plane; things are going on behind, and things are pressing forward as well. His color palette is more varied than that of the other Pop artists...and his shifts in the scale of objects within a composition are more drastic....Another factor that sets Rosenquist apart from the other Pop artists is the degree to which he has relied on handpainting....He is a superb painter in a very traditional sense, producing very untraditional images." One of the artist's most startling and memorable works is "Bedspring," a 36-inch square oil on canvas with painted twine and stretcher bars. Created in 1962, it is in the collection of the artist and is fascinating for the way the artist cropped out the woman's mouth and nose. It is almost terrifying because of the taut way in which the canvas is suspended within the frame by painted twine, and because of the perhaps concerned expression of the subject, but its sensuous colors and beautiful eye suggest it is an endearment rather than a dissection. It is in the collection of the artist. One of Rosenquist's most famous images is "President Elect," an oil on masonite that measures 7 feet 5 3/4 inches by 12 feet. Executed in 1960-1 and 1964, it is in the collection of the Centre Georges Pompidou, Mus�e National d'Art Moderne/Centre de Cr�ation Industrielle in Paris. Rosenquist, according to Hopps, utilized various methods to incorporate "a collection of things into a composition in such a way that they they make a kind of sense, even if it is sometimes in counterpoint to what the individual objects imply. One early method he used was to divide the pictorial spaces of a canvas symmetrically into four quadrants and quite artibrarily, it wuld seem, put a different cropped image in each one....In other works , the elements may be set edge to edge or juxtaposed so that they seem to overlie or even mesh with each other; sometimes, the edges are serrated so that two layers interlock....Rosenquist has also disrupted space in quite literal ways: for Forest Ranger..., he painted an Army tank on Mylar, which he then cut into strips, so that you could walk through it, like a car going through a car wash....With these devices, Rosenquist has managed to include more compositional elements than almost any of his contemporaries...Rosenquist is an artist for whom the conjunction is almost invariably 'and' rather than 'or. '...President Elect...has a tripartite structure with, left to right, a close-up of John F. Kennedy's face, a woman's hands holding a slice of cake, and a portion of an automobile. 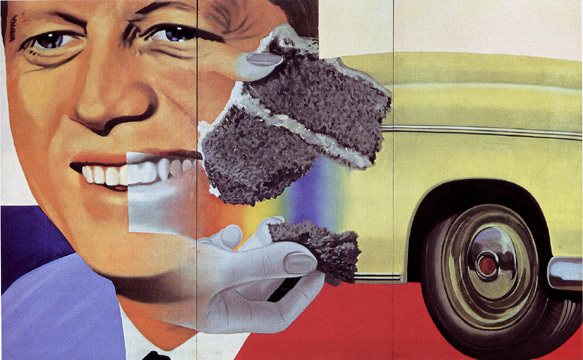 As Rosenquist explains, 'The face was from Kennedy's campaign poster. I was very interested at that time in people who advertised themselves. What did they put on an advertisement of themselves? So that was his face. And his promise was half a Chevrolet and a piece of stale cake.'" Later in his career, Rosenquist's subject changed from rather static snapshots to hyperenergetic panoramas of considerable complexity. "Women's Intuition, after Aspen," is a stunning example of Rosenquist's swirling imagination. 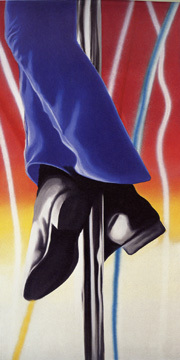 An oil on canvas, it measures 5 by 12 feet and was executed in 1998. It is in the collection of Marvin Ross Friedman of Coral Gables, Florida. In discussing "an extraordinary set of three paintings, The Swimmer in the Econo-mist (1997-98...)," Hopps maintains that "everything in these paintings is in flux, thrown in to a whirling vortex of anamorphic shapes. In The Swimmer in the Econo-mist (painting 3), the conical hairdryer from F-111 is reprised, now surrounded by lipsticks. 'The little girl who was the pilot of the F-111 is now the heiress who controls Wall Street,' Rosenquist says. This group of works is dominated by the color red, but it also contains yellow and black to make up the colors of the German flag. In The Swimmer in the Econo-mist (painting 1), a quite literal depiction of Pablo Picasso's Guernica (1937) floats toward the right of the painting into a red river of activity. It is bent and broken,as if it has been tossed and damaged as it rushes along." Some of his most successful late works, like "Nasturtium Salad," with overlapping, serrated shard-like images, invoke the cut-outs of Matisse, albeit in a less lyrical, way. They are quite beautiful. In her catalogue essay, "James Rosenquist: collage and the painting of modern life," Julia Blaut quotes the artist as stating that "a good painting continues to ask you to seek out information it has to offer for a long time," adding that "There's something to the idea of the glimpse...After that glimpse, there's the follow-up." Many of Rosenquist's best works are not collages and not always colossal. 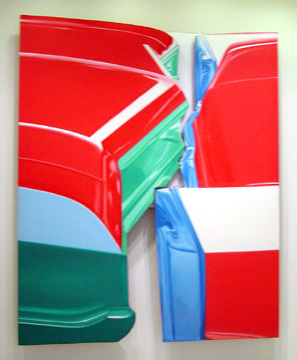 "Car Touch," an oil on shaped and mechanized canvas panels, is a fine composition in which the front and rear of large American, chromed cars, appear bumper to bumper. Although it is large, 7 feet 4 inches by 6 feet 2 inches, this 1966 work could be much smaller . The fact that it is mechanized is cute, but not necessary. It is a well-conceived focus. Sometimes Rosenquist just creates something that is lovely. "Mirage Morning," a color lithograph with Plexiglass and painted window-shade fixtures, string and stones and fenestrated and painted window shade, is both elegant and boisterous, intricate and intriguing. Published in an edition of 40, it measures 3 feet by 6 feet 2 inches and was executed in 1974-5. There is a famous "match game" in "Last Year at Marienbad," the great Alain Resnais film, that frustrated many. It involved removed one match at a time from any of several rows that contained different numbers of matches. "Snow Fence," a 1973 oil on canvas, probably has nothing to do with that game or with "pick up sticks." It is perhaps just another throw-away example of Rosenquist's virtuosity. It is a very strong work that bears little resemblance to much of his oeuvre. "Sketch for Fire Pole Expo 67 Mural Montreal Canada; Study for File Pole," is a simple but very powerful image that again demonstrates Rosenquist's talent. Some of the other striking works in the exhibition include "Terrarium," a 1977 work in the collection of Anne Anka of Los Angeles, which has a Japanese feel to it; "Leaky Ride for Dr. Leakey, 1983 work in the collection of the San Francisco Museum of Modern Art, gift of Harry W. and Mary Margaret Anderson, a work in which pencils have replaced lipsticks; and "Celebrating the Fiftieth Anniversary of the Universal Declaration of Human Rights by Eleanor Roosevelt," a 1998 work in the collection of the artist that features eyeglasses and barbed wire. 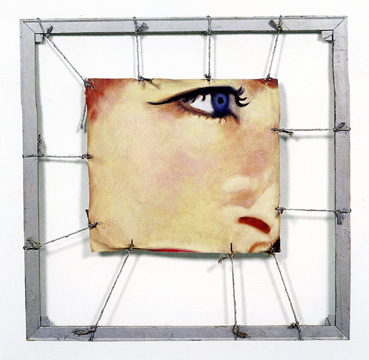 Rosenquist has a strong feel for sculpture. 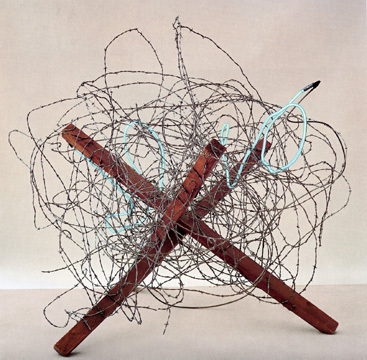 "Tumbleweed" is a marvelous confection of chromed barbed wire, neon tubing and wood that he made from 1963 to 1966. In 1976, he designed Calyx Krater Trash Can that featured an etched image in gold of figures from a Greek vase on the side of a steel trash can. "Rosenquist," Hopps concluded, "is an important and remarkable imagist, in the original sense of the word. He is very much a visual poet. Sometimes his poems are epic; somethings they are vast in subject or in scale - but they are still poems. His paintings are not narrative, like a novel; they are rich and complex, but you can read them in a short span of time. He orchestrates combinations that seem absurd - a French horn and a black hole - but those combinations also make a curious sense, both formally and psychologically." Rosenquist is certainly epic and grandiose and theatrical, often excessively. Not everything is a thing of beauty, or even coherence. Yet he has produced some truly fine work that is masterful and often exciting. He is probably too brazen to be viewed as a poet. One suspects he does not choose to whisper very much. There is little doubt, however, that he usually has something of considerable interest to communicate despite his almost too-facile techniques. He has a very fertile mind, which is, of course, rare.